"In 1864 the ford across the Blue River was near where the bridge to the north now stands. Blue River Road did not exist then. 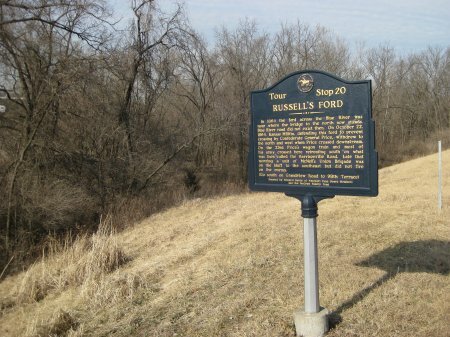 On October 22, 1864, Kansas Militia, defending this ford to prevent crossing by Confederate General Price, withdrew to the north and west when Price crossed downstream. 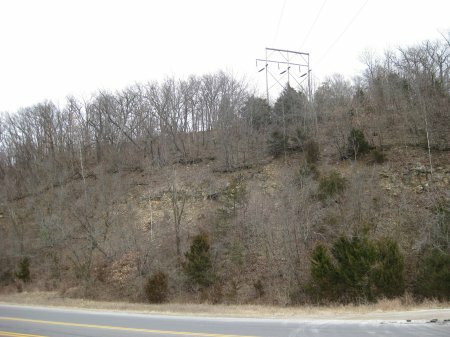 On the 23rd, Price's wagon train and most of his army crossed here retreating south on what was then called the Harrisonville Road. Late that morning a unit of McNeil's Union Brigade was on the bluff to the southeast but did not fire on the enemy." Directions to Stop 20: Continue south on Swope Parkway and turn right (west) onto Meyer Boulevard. After about 0.6 miles, head south on US Highway 71. After about 2.3 miles, take the 85th Street exit. Turn right (west) on 85th and after about 0.1 miles, turn left (south) on Hickman Mills Road. Follow Hickman Mills Road for about 0.1 miles and turn right (southwest) onto Blue River Road. Follow Blue River Road for about 0.7 miles and the marker will be on your right just before you reach the intersection with Grandview Road. This tour stop is located in Kansas City, Missouri 64131. 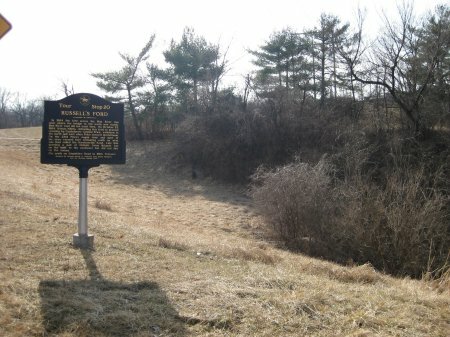 Description: Price's wagon train and cattle herd crossed to the west side of the Big Blue River here at Russell's Ford. Just to the north on those bluffs was where Union General John McNeil had his Second Cavalry Brigade ready to attack the Confederates. On October 22, 1864, Price had put Major General James F. Fagan in charge of guarding the Confederate wagon train. Fagan had made this the responsibility of Brigadier General William L. Cabell's Cavalry Brigade. Cabell was also accompanied by several thousand of the unarmed recruits. The wagon train left Independence on October 22nd. On October 23, 1864, Price's 600 wagons and 3,000 head of cattle were still east of the Big Blue river but moving southwest towards Little Santa Fe. Cabell was moving the wagon train down the Hickman Mills Road until he could turn southwest to Little Santa Fe (Tour Stop 22). Meanwhile, Union Major General Alfred Pleasonton wanted to cut off the Confederate army's possible path of retreat. Shortly after midnight on October 23rd, Pleasonton ordered Brigadier General John McNeil to take his Second Brigade down the Independence Road and then on to Little Santa Fe arriving at daylight. McNeil had left shortly after midnight. He stopped just before daybreak to feed his horses. By daybreak he was still far way from Little Santa Fe. He began hearing the fighting at Byram's Ford and moved rapidly toward Hickman Mills. After advancing four miles he came upon the left and rear of Price's wagon train. Cabell's Brigade from Fagan's Division and Tyler's Brigade (mostly unarmed) from Shelby's Division were guarding Price's wagon train. It was slow going through the night. When McNeil came upon the wagon train, the cattle herd had already reached Little Santa Fe, but the wagon train had just reached Hickman Mills. Cabell quickly put his brigade between the wagons and McNeil's Brigade. Pushed back by rebel skirmishers, McNeil finally formed his troops into a battle line and began to advance toward the wagon train. Battery L (three guns) of the 2nd Missouri Light Artillery fired on the Confederate troops. Cabell brought up Hughey's Arkansas Battery (two guns) and directed fire on the Federal battery. McNeil was forced to withdraw 400 yards and regroup. McNeil did not press the attack any more that morning. Upon hearing his wagon train was being threatened, Price quickly went south. While Cabell was holding off McNeil, Price got the wagon train across the Big Blue River and into Little Santa Fe (Tour Stop 22). It then turned south on the military road. By afternoon, parts of the retreating Marmaduke Division were joining up with the wagon train.